Spring is in the air, and spirits rise along with the temperatures as an abundance of family-oriented activities, attractions and festivals pop up like seasonal flowers on the landscape of two popular Arkansas towns: Eureka Springs and Hot Springs. Each an easy drive from Acadiana, these two “springs” are a natural choice for a vernal vacation. 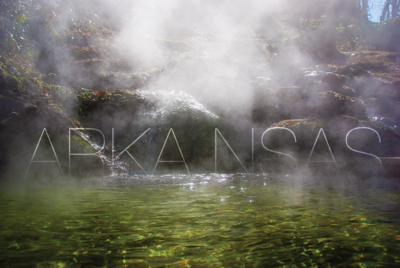 Known as the “Valley of the Vapors” and “Spa City,” for centuries Hot Springs has been a destination for visitors making pilgrimages here for the healing properties of its thermal waters. These spas, some dating back to the early 1900s, helped transform the city into a boomtown; during its heyday, the city’s Central Avenue was lined with elegant bathhouses. Today, visitors can still get a feel for the historic bathhouses at The Buckstaff Bath House, which has offered transcendental treatments to weary travelers since 1912. A waterfall of natural hot springs pours into a small pool. Steam surrounds the area because of the hot water on a cold morning. If you’re searching for a more energetic experience with H2O, Magic Springs and Crystal Falls Water and Theme Park makes a big splash with the young and the young at heart. Traditional rides range from carousels to roller coasters and, for those eager to take the plunge, the park offers thrill rides such as the Boogie Blast, the Seven Falls Slide Tower, and the Rapid Falls Raceway. Water is a running theme in Hot Springs, and on May 16, onlookers will be in a lather as they line the streets of historic Bathhouse Row to cheer on the costume-clad competitors who will try to ‘clean up’ in the annual Running of the Tubs. Attendees get in the spirit of the sudsy showdown by donning powder room paraphernalia including bathrobes and shower caps and other whimsical costumes as they propel their tubs through downtown streets. For more aquatic-themed adventures, choose an amphibious expedition aboard a Hot Springs National Park Duck Tour, which takes tourists down Bathhouse Row and past landmarks in town including the high school where former President Bill Clinton graduated. As the tour approaches Lake Hamilton, your land vessel (a World War II-era amphibious landing craft) becomes a boat with views of the scenic shoreline and elaborate lake homes, such as the historic Hamilton House Estate. Another favorite water tour is on Lake Hamilton’s Belle of Hot Springs Riverboat, a 15-mile excursion. Narration by the cruise’s captain offers insight into the area’s history and mysteries as passengers enjoy either an afternoon or evening tour. Sightseers will be in seventh heaven as they enjoy a bird’s eye view of the town and surrounding Arkansas countryside from Hot Springs Mountain Tower. Perched atop Hot Springs Mountain and upgraded several times over the years, the 216-foot tower has been a local landmark for over a century. The Ouachita Mountains and Hot Springs National Park are just two of the scenic sites that can be spotted thanks to a panoramic view stretching for an astounding 140 miles. Buckstaff Bath House; View from Garvan Woodland Gardens viewing platform. Visitors can converse with nature while taking a constitutional along one of Hot Springs National Park’s many trails, which range from short but sweet strolls along the botanically themed (and under half-mile) Floral Trail and Honeysuckle Trail to the more extensive 10-mile trek along the Sunset Trail. Beloved for its beauty in springtime, walkers on their way to see the Balanced Rock on the Sugarloaf Mountain section of the trail are greeted by the vibrant blooms of phlox and fire pinks. Expand your horticultural know-how at the University of Arkansas’ Garvan Woodland Gardens, a petal-filled paradise which includes the interactive Evans Children’s Adventure Garden, complete with a waterfall, a rock maze and wading pools; Daffodil Hill, which is painted with Mother Nature’s kaleidoscope of colors (including 235 types of Narcissi); and the Asian-inspired atmosphere of the Weyerhaeuser Bonsai Garden and Learning Center. Hearing “Ozarks,” many travelers picture the Missouri Ozarks, home of the wildly popular community of Branson. However, Arkansas is also home to its own Ozarks, a quieter version that recalls pioneer life and a rich history in a part of the state well known for its scenic beauty. One of the best-known destinations in Arkansas’s Ozark region is the historic city of Eureka Springs, a community that combines Ozark charm with Victorian elegance. This hilly city, filled with narrow, winding streets, is known for its historic buildings. And although it may not be as well known for its waters as Hot Springs, Eureka Springs has a rich spa history as well. In fact, these springs drew early residents to this town–as many as 10,000 by 1879–which accounts for the city’s extensive Victorian architecture. But spring is definitely a time to get out and enjoy the outdoors – and Eureka Springs offers a unique opportunity to enjoy a vintage view of springtime in the Ozarks. You’ll know you’re on the right track when you hear the conductor shout “All aboard!” on the Eureka Springs & North Arkansas Railway. Leisurely excursions on the company’s 1940s diesel locomotive (and explorations of stationary railroad-themed exhibits) begin with Saturday-only sojourns in April, and then gain full speed in May with expanded schedules. Passengers can also enjoy an epicurean adventure as they dine in style in the Eurekan Dining Car. If a presentation of horsepower is more your speed, check out a celebration of a classic American car at the annual Eureka Springs Mustang Show. Taking place May 23 at Pine Mountain Village, automobile admirers can take a trip down memory lane as they watch an array of vintage vehicles and modified Mustangs cruise along the streets of the historic business district during an hour-long parade. Whether you have a green thumb or are all thumbs, the bouquet of botanical beauty at the historic Blue Spring Heritage Center is a perennial favorite of anyone with a love for floral finery. Visitors can propagate their love of flower power amid the profusion of pansies, primulas, Himalayan blue poppies, and forget-me-nots that welcome warm weather visitors to the site’s many themed gardens. These include the Medicine Wheel Garden, which honors the planting patterns of Native Americans; the Three Sisters garden, an homage to the ecosystem; and the Woodland garden, which offers a haven for native plant life. Guides garbed in Victorian attire are the driving force behind Eureka Van Tours, a 2 1/2-hour road trip past landmark edifices from the 1800s, among them Eureka Springs’ Crescent Hotel and Spa (which has a reputation as the country’s most haunted hotel). Other sights on the tour include the train station, Hatchet Hall – the house that temperance movement leader Carry A. Nation once called home –and more than 100 centuries-old buildings that are enjoying a new lease on life as restaurants, galleries and shops. Want to take a short break from the springtime sunshine? Visit a site that’s cool in more ways than one. The temperature will tumble to 57 degrees as visitors admire stalagmites and stalactites on a self-guided, half-hour tour of Onyx Cave Park. The cave offers an easy walking trail and an onsite rock shop selling onyx jewelry and other gift items. Whether you choose Eureka Springs, Hot Springs, or a combination of the two destinations, one thing’s for sure: spring has sprung in scenic Arkansas. For more bloomin’ good activities in Eureka Springs and Hot Springs, visit eurekaspringschamber.com and hotsprings.org.